This innocent little card was written on 30 January and posted in Odessa on 31 January 1918 - incidentally, the last day of the Old Style calendar in Russia which then jumped forward to 14 February. 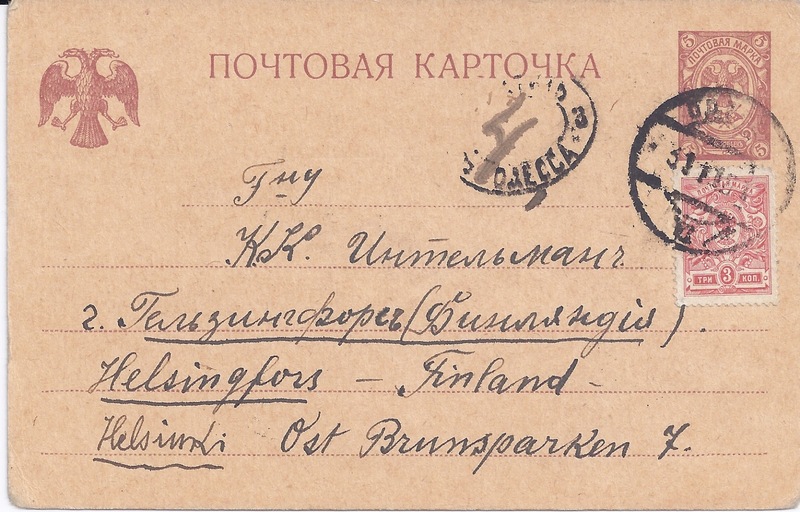 Addressed to Helsinki, it has been franked at 8 kopecks - the correct Provisional Government tariff for a foreign postcard, applied since 1 September 1917 and continued in the RSFSR until replaced by the Tariff of 10 March 1918. So why has it attracted an Odessa Postage Due cachet, claiming 4 kopecks - indicating a deficiency of 2 kopecks in the franking? The answer is very simple: the post office has (just) adopted the first Ukrainian National Republic Tariff of 28 January which prices postcards, wherever they are going, at 10 kopecks. Less simple is the answer to the question, Did it reach Helsinki? Well, in favour of that is the fact that the card was in a collection formed in Finland. 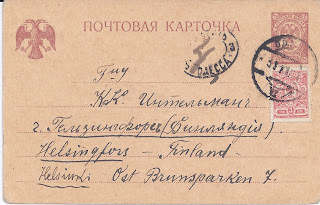 And it's true that at this early stage of Ukrainian independence some mail exchange with Russia seems to have continued and Russia definitely continued exchanging mail with Finland - though delayed at this period by Finland's own Civil War. On the other hand, Finnish mail whether Registered or not usually picks up a Helsinki roller cancel on arrival and this card has nothing at all to indicate arrival.